Obama is one of the frugal personalities in the world and so his Limo as well, that’s why auto fraternity tagged it as “The Beast”. Being as the President of America Obama travels a lot, and to be safe and sound his Limo is also exported to the destinations wherever his master goes. This time it seems that the Beast was not feeling well so was being lugged on the towing vehicle. On contradictions, Israeli media and Channel 2 television station had reported that, someone from the Secret Service had filled in ‘diesel’ in the fuel tank instead of petrol. This had caused a breakdown on the motorway between Ben Gurion Airport of Tel Aviv and Jerusalem. This scenario had happened before the arrival of Mr. President, who was scheduled to travel by helicopter from Tel Aviv to Jerusalem and then in a car for city ride. 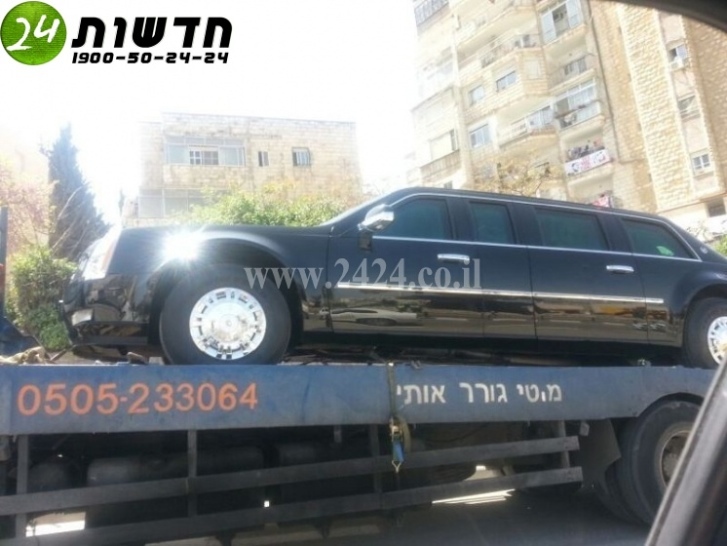 To save the Obama’s day, another vehicle was flown in from Jordan form to fill that clinching gap of Limo. This sort of incident is not new with the US Secret Service because, some days before as well, Beast had ruined the schedule as stopped while walking down the ramp of US Embassy in Dublin, Ireland. As of in Tel Aviv, officials of US Embassy then barged into the issue and called up a towing service to do the remaining part. Anyhow, all had settled down very well, while we think that, why the American Government is not shelling out funds for rolling in a new car at President’s Office, which may not get stranded and create a havoc.